HONR Network is a 501.c.3 non-profit organization dedicated to Stopping the Continual and Intentional Torment of Victims. The HONR Network believes that decent society should not tolerate those who exploit tragedies and prey on the victims of violent crimes. Americans who’ve lost their loved ones should be allowed to grieve in peace without being harassed, exploited or subjected to online defamation. Unfortunately, the publicity surrounding most high-profile tragedies makes these vulnerable people ideal targets for this kind of persecution. In the wake of recent mass murders such as the Sandy Hook Elementary School shooting, Boston Marathon bombing, and the Orlando Pulse nightclub shooting. Conspiracy theorists have descended upon the bereaved like vultures, accusing them of being actors in elaborately staged government plots to deceive the public. Then there are the emotionally disturbed and mentally ill individuals who are easily provoked by the false information spread by conspiracy theorists. They target the surviving family members and stalk them relentlessly, issuing actual threats and often telling the victims that their loved ones didn’t die—or worse yet—never existed. Fortunately, U.S. laws exist that hold accountable those who libel, slander or otherwise defame the dead and living. Other laws levy severe penalties against those who stalk, harass and intimidate, both online and in person. Of course, filing this kind of legal action requires competent representation, and this comes at a cost. Please help us in our mission to stop this concerted effort to besmirch the memory of the slain and prolong the anguish and suffering of those they left behind. Your assistance is greatly appreciated. 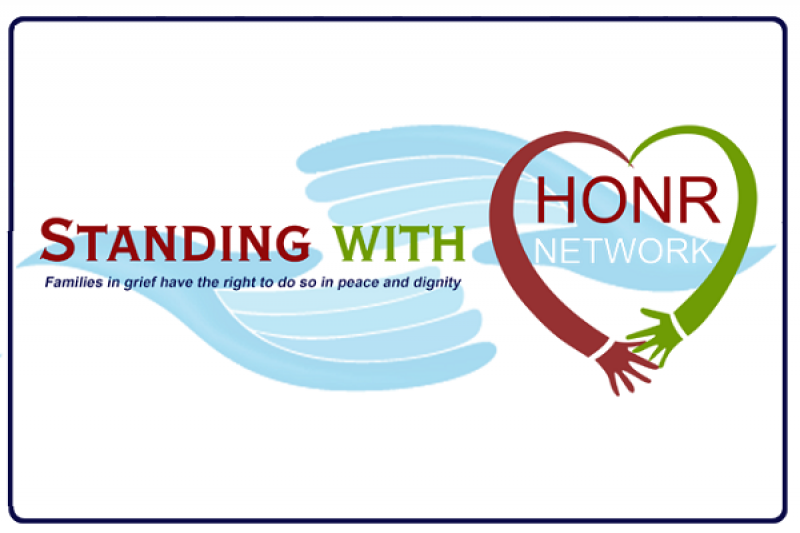 HONR Network is committed to standing up in defense of victims and their families affected by incidences of mass violence. With every tragic new incident, conspiracy theorists are renewed in their zeal to unleash torrents of abuse, harassment, defamation and hate towards survivors and their families. Some are driven by pure delusion that such incidences are staged hoaxes, while others simply for profit. Whatever the reason, HONR Network is dedicated to taking necessary action, within legal parameters, to bring accountability to Abusive Hoaxers; whether social or legal. The viciousness and cruelty visited upon those in trauma, pain, and grief by callous sociopaths cannot go unchallenged. The legions of additional followers the slanderous rhetoric attracts to churn out even more recruits to the mass delusion, and subsequent harassment of innocents, must be abated. HONR Network is currently undertaking the task of financially assisting Sandy Hook parent Leonard Pozner, who’s 6 year old son Noah was killed in his elementary school along with 19 of his classmates and 6 female educators, to civilly prosecute Wolfgang Halbig. As Mr. Pozner and his family grapple to deal with grief and moving on with life without Noah, Wolfgang Halbig spreads slanderous and defamatory propaganda against Mr. Pozner and his family, as well as that of the other Sandy Hook victims. Mr. Halbig’s campaign of disinformation and hate speech has resulted in the escalation of harassment and death threats toward Mr. Pozner, and continues to recruit new foot soldiers to the Sandy Hook truth movement every day. Recent history has demonstrated that some of these “truther” types are dangerous to society, and have committed a slough of crimes as a result of their mindset. Moving into the near future, HONR Network hopes to assist in the civil prosecution of other Gun Truther and Hoaxer leaders who spread “hoaxer” propaganda, which convinces legions of weak minded conspiracy theorists that the Sandy Hook massacre was a government perpetrated hoax for the institution of gun control, and the victims and families of the Sandy Hook shooting are “crisis actors”. American “free speech” laws impede the authorities from prosecuting the abusers, but “free speech” laws do not exempt such abusers from civil prosecution. Civil litigation is a very costly endeavor, and requires ongoing infusions of funds to carry through to completion. HONR Network needs the support of concerned, empathetic citizens who want to see such abusers punished for their actions. Please consider donating to our cause, so we can be effective in our quest to combat the cruelty perpetrated against those who have lost loved ones to unspeakable tragedy. The newspaper stories on Alex Jones.